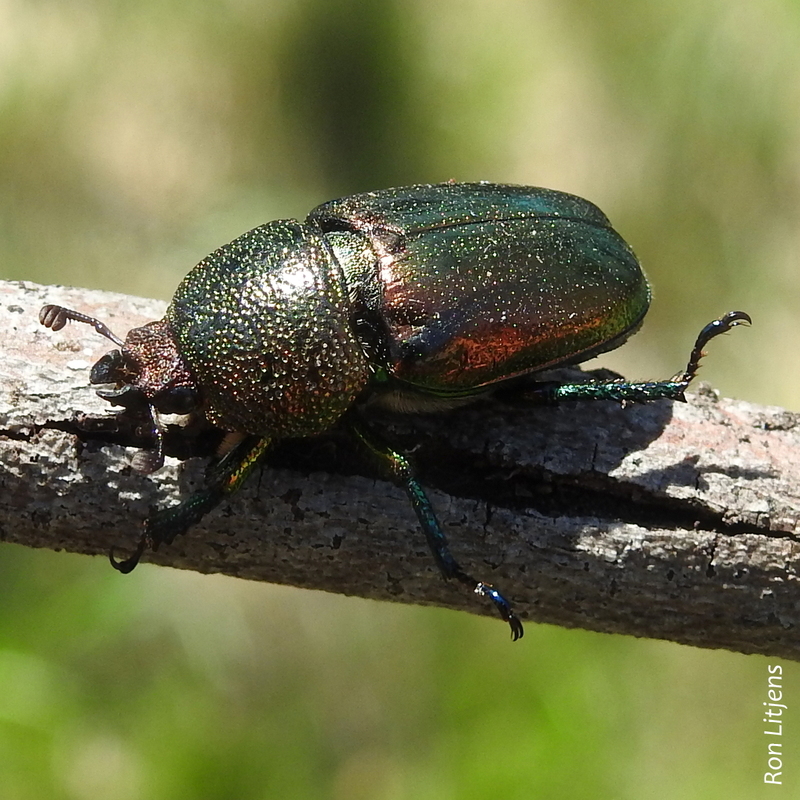 The topic of beetles has been getting a bit of a flogging on this website lately. At the moment they are out in force, feeding on nectar-bearing flowers. The Stag Beetle pictured left (Lamprima sp.) is one of these. It is stunning and its visual appearance is due to two different processes of light. A close look at the carapace shows that it is dimpled. When the beetle is viewed from above in the sunlight it looks like it is covered in tiny little LEDs. This is due to reflection. The sunlight striking the beetle simply gets reflected back but at all different angles due to the curvature of the dimples. 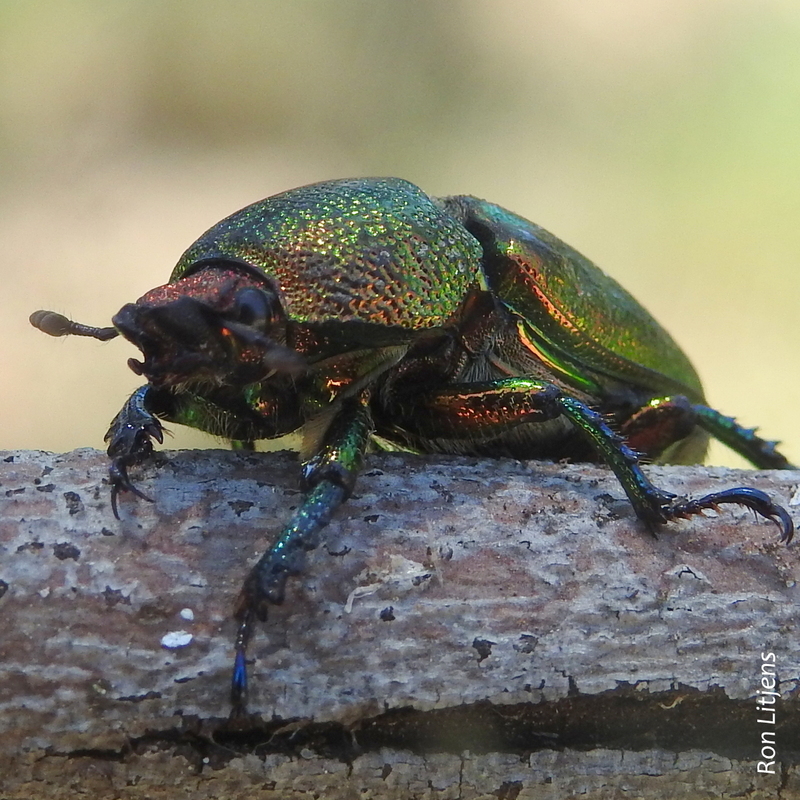 The shimmering colours on the beetle’s shell (pictured above) are due to a process known as diffraction. Sunlight striking the shell gets broken up into spectral colours (nominally red, orange, yellow, green, blue, indigo and violet). Those old enough will remember the album cover of Pink Floyd’s Dark Side of the Moon showing light being diffracted into the different colours by a prism. This process is also responsible for phenomena such as rainbows, the blue bands on Blue-banded Bees and the colourful eye-spots on some butterflies and moths. Instead of a prism diffracting the light on the beetle’s shell there are grooves. For these grooves to cause light diffraction they have to be spaced at intervals approximating the wavelengths of the colours. For example the wavelength of green light is nominally 550 nanometres (550 millionths of a millimetre) so the grooves must be similarly spaced, much smaller than the eye can detect. So what makes this beetle so colourful is not only its cute dimples but its groovy shell.